Remember the home made popsicles we all used to make when we were kids. I remember it being quite fun but not tasting all that great. I think the most popular choice for these frozen treats was orange juice. While organge juice taste nice and sweet in a tall glass, it often comes out a bit sour when its frozen. So one hot day while I was sitting at my computer working I remembered we had this popsicle tray that we havent used in over five years. In an effort to get my kids to enjoy a healthier treat than the traditional freeze pops that contain nothing but colored sugar water we decided to test our homemade popsicles with other juices. The juice that won hands down was grape juice. 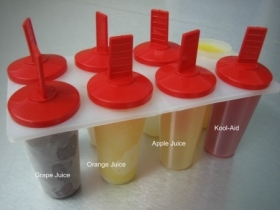 Try adding grape juice to your popsicle tray and you�ll see what a tasty treat is like. Having fun with our little experiment we decided to add different flavors to see what we could get out of it. Besides grape juice and orange juice, we added apple juice and Kool-Aid. I know Kool-Aid is also just sugar but I have to say it tasted great. I took that flavor for myself. By the way, if you do plan on using Kool-Aid make sure to add more powder than normal so that it doesn’t taste watery after it freezes. We still have to experiment with other flavors like lemonade. Also, if your family drinks pop (soda) and you happen to have a bottle of flat pop lying around (who doesn’t) making popsicles with it is a great way to get rid of the syrupy stuff no one wants to drink. There is no better homemade treat on a hot summer day than a nice juice popsicles. Laurie thats a good suggestion. The jello and the fruit juice make it taste good and sweet. I guess you could do the same thing with the Kool Aid. If you use half kool aid and half fruit juice it should come out tasting good also. Previous story Are You An Awesome Dad?